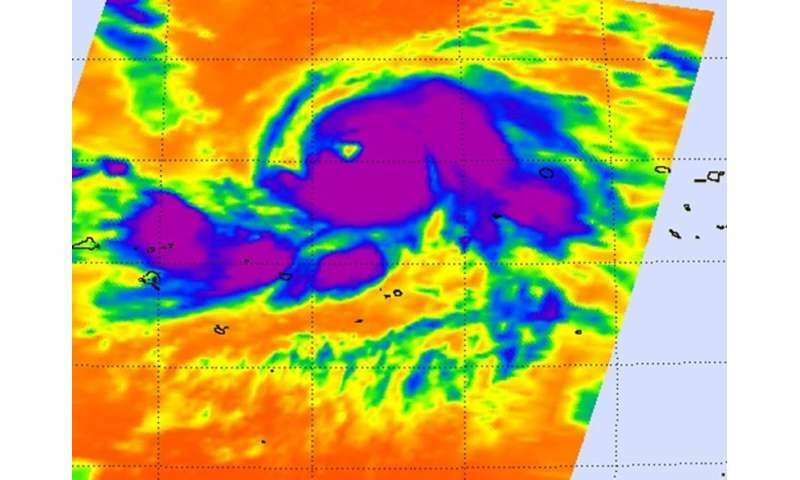 NASA's Aqua satellite passed over Typhoon Nangka on July 6 and took an infrared look at the large storm as it strengthened from a tropical storm into a typhoon. The Atmospheric Infrared Sounder or AIRS instrument aboard NASA's Aqua satellite gathered infrared temperature data on Nangka on July 6 at 15:11 UTC (1:11 p.m. EDT). The infrared data showed a large storm with the bulk of thunderstorms east of the low-level center. The 20 nautical-mile-wide (23 miles/37 km) eye of the storm is also visible on the image. Fragmented bands of powerful thunderstorms surrounded the storm southwest of the center and east of the center. The coldest cloud top temperatures were near -81 Fahrenheit or -63 Celsius. Cloud top temperatures that cold are high into the troposphere and capable of generating heavy rain. On July 7, regional warnings were in effect for several areas as Nangka continues moving through the Northwestern Pacific Ocean. A typhoon watch is in effect for Agrihan, Pagan and Alamagan in the northern Marianas. At 1500 UTC (11 a.m. EDT) on July 7, Typhoon Nangka's maximum sustained winds were near 120 knots (138.1 mph/222.2 kph) and the storm continued to strengthen. Nangka was centered near 14.3 North latitude and 153.4 East longitude, about 496 nautical miles (570 miles/918 km) east of Andersen Air Force Base, Guam. Nangka was moving to the west-northwest at 14 knots (16 mph/26 kph). The Joint Typhoon Warning Center forecast calls for Nangka to move west-northwest, while steadily intensifying. The system will strengthen to 140 knots (161 mph/259.3 kph) after today, beyond which it will start to weaken. At 140 knots, that would make Nangka a Category 5 typhoon on the Saffir-Simpson Wind Scale. Nangka is anticipated to turn to the north by July 12, when it is expected to be just south of Iwo To.